Here's a listing of used and trade-in boats. A GREAT opportunity for any Fire Department, Port Authority/Facility. 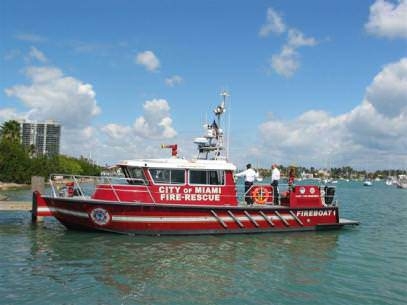 The City of Miami is having TWO new Firestorm 50’s built - and have traded in their 2008 Firestorm 48. The boat has a recent survey valuing the boat at $650,000. The current replacement cost is $1,450,000. 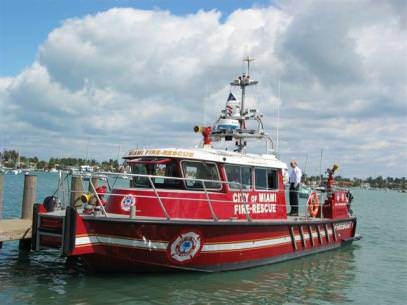 This boat is equipped with twin Darley 1750 GPM pumps, flow tested to 4000 GPM at 150 PSI. 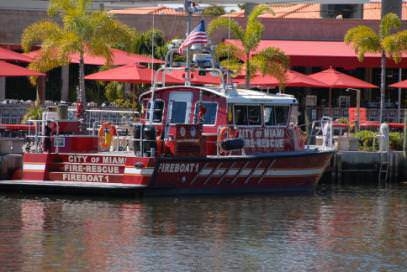 The boat is designed to operate both pumps while maneuvering, or tied to the dock. Twin Iveco 13L engines rated at 770HP each, powering twin Hamilton Jet HJ364’s with Blue Arrow control, with all service and maintenance performed by the local Iveco dealer. Main Cabin seats 3 crew and has a full patient berth (or can be used for additional seating). Cabin has standing head room of 7 feet. Cuddy cabin has 2 berths or seating for 6, and also includes a head and sink. Cabins are cooled with CruisAir 32K BTU reverse cycle HVAC. The forward center cabin window hinges open to allow a backboard or litter to be passed directly into the cabin. Heated windows for always clear visibility. Fridge and microwave are located in the stbd side chart table. Easy access To the fuel compartment for plenty of equipment access and stowage space! Helm is equipped with Kiekhaefer zero effort controls as well as The Hamilton Jet Blue Arrow system. Navigation info is displayed On dual Furuno NavNet 2 plotters displaying radar, GPS and depth. A Furuno VHF, 2-Motorola XTL-5000, NVTi FLIR, Simrad 1550 RDF, Magnetic and Electronic compasses, Whelen Siren, Dual ACR search lights, AM/FM/CD, EPRIB, Dual bilge pumps per compartment, High Water alarm, Engine room FM200 Fire suppression. AC power is provided by a Cummins/Onan 13.5kW diesel genset. The twin Darley 1750 GPM pumps are capable of putting out more than 4000 GPM together. The bow and roof monitors are Elkhart 8394 RF monitors with SM2000BE nozzles. 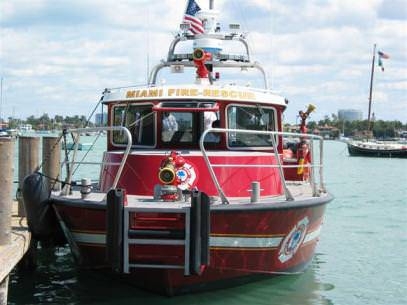 Aft deck manual Elkhart monitors Are fitted with SM1250 and smooth bore nozzles. One LDH Storz discharge is located on the stbd side of the aft recovery platform. 60 hours of test usage, Deep V high performance hull. Deck tracks for Shoxs seating and cargo. 24” Wing inflatable collar with dive door cutouts. ABS/IACS robust hull structure, ¼” hull bottom, 3/16” hull sides and decks. New 2 man console, can be customized to customer needs. Seating to customer needs. ISO stability Cat B. Load capacity, 5000 lbs. Heavy Duty hinged radar arch. Heavy Duty outboard guard. Large lazarette locker, bow locker, below deck storage. 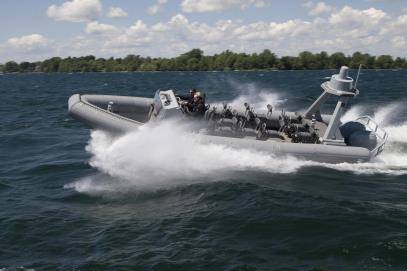 Base boat $199,000 CAD plus power and electronics.